In August of 2001, I went to Boothbay Harbor, Maine to live and work aboard HMS BOUNTY. 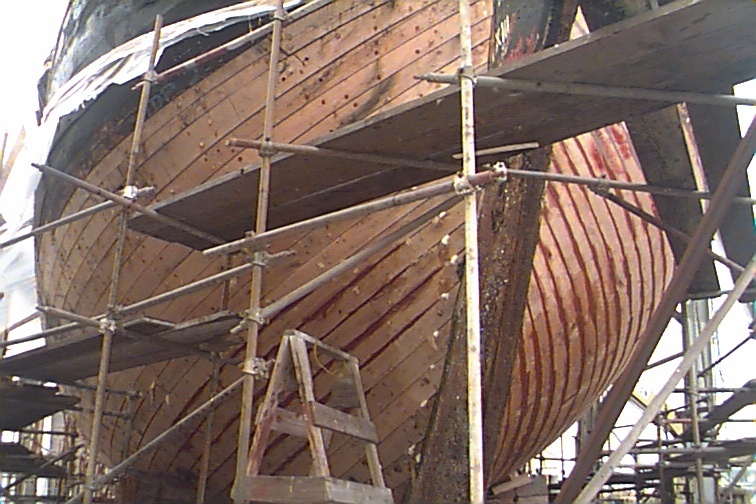 The ship was out of the water while major hull work was done on her by Samples Shipyard and the wonderfully able crew of shipwrights there. The ships crew, consisting of the Captain and two others, and a handful of occassional volunteers, was reworking the interior of the ship. At first it was very strange living aboard a ship that was not only out of the water, but up on a marine rail car. Our water came in through a garden hose, we had only minimal electrical power, and for a time, at least, we had waste water hooked up. I stress that it was waste water - nothing else was to be put down the pipes! For most necessities we had to travel up to the main deck, over onto the staging, down a 20' ladder and into one of the adjacent buildings. When it got cold there was no heat, and for sure you weren't going to sleep past 6AM when the shipwrights all started their chainsaws! 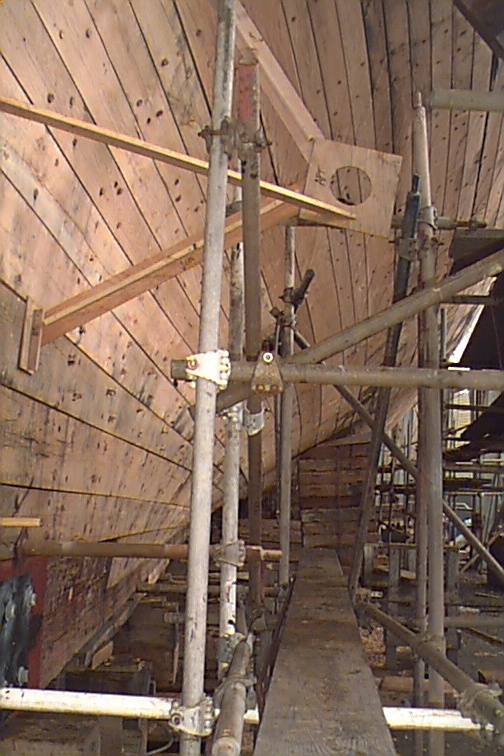 As you can see the ship received all new white oak planking below the water line. Also, many of the frames were replaced, and some of the ceiling (interior planking) was changed out. What isn't so obvious is all the interior work that went on during this period. The ship was nearly totally rewired, a new galley was put in, new water tanks and waste system, and many other improvements. The ship also received a new diesel electric drive system, including new props and shafts. In the above photo you can see the workup for the new shaft logs being fitted. Some much needed restoration work was done by volunteers during this time. 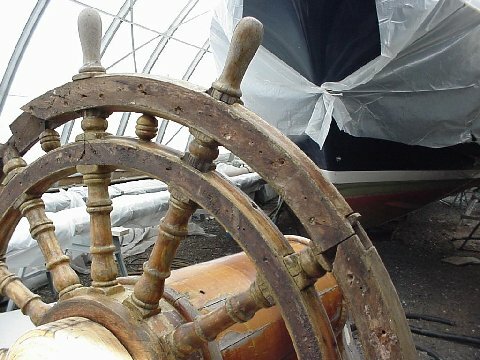 The original ship's wheel was lovingly restored. You can see it needed it badly after all the years it's been exposed to wind, rain, sun, snow and salt spray. 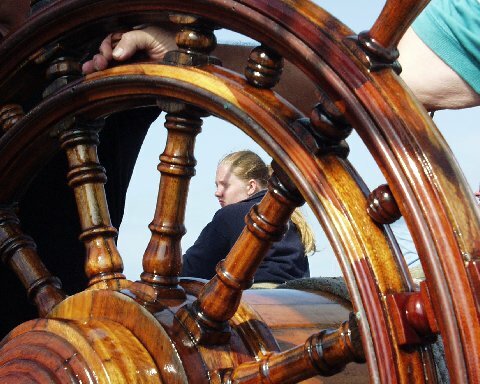 The wheel has quite a history of its own, predating the current BOUNTY. 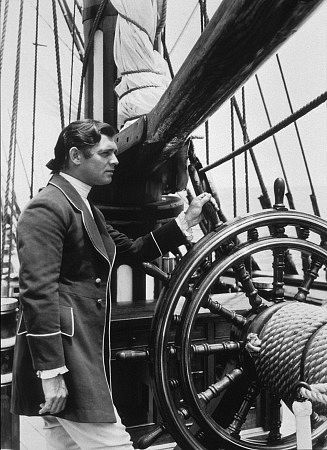 Below is a photo of the same wheel in the 1935 Mutiny on the Bounty with Clark Gable.